Hi-Tech Wild-Trek has been working with Test Valley Borough Council to deliver a programme of school visits and annual Discovery Days at venues in Andover, Romsey and Chandlers Ford. Schools within Test Valley are invited to take advantage of a free half-day visit to one of four local nature reserves. 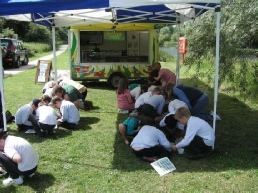 Each visit allows the children to work with the Hi-Tech Wild-Trek trailer to discover the freshwater animals on the site and to take a tour with a countryside officer to learn more about the wildlife to be found there and the way the site is managed. This programme ran for the first time in 2003 and visits take place in May, June or July. For many of the schools, the site they visit is within walking distance and so children are learning more about their local environment. Some schools have taken part every year while others dip in and out of the programme as required. Demand for places is always strong, however, so it pays to respond to the invitation letter quickly. If you are at a school in Test Valley and haven’t received an invitation please get in touch. The role of Hi-Tech Wild-Trek is to run a session in which all the children have the opportunity to use a net and catch and sort a sample of animal life from the pond or stream on the site. The aim is to find as many different animals as possible and create a list to show the biodiversity to be found within the water. The animals are displayed on screen in the trailer providing an opportunity to talk about adaptations for moving and breathing under water. Life cycles and feeding relations are discussed too and in many cases demonstrated live on screen. Regular collecting visits can be very important as a means of monitoring the site and being aware of any changes that might be occurring. To increase the effectiveness of this process, each session includes counting or estimating numbers for some of the key species. This data can be seen by visiting the individual site pages. 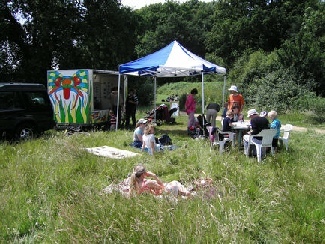 Each reserve holds an event each year at which families are encouraged to come along and discover more about their local wildlife patch. Children who have enjoyed the school visit have the opportunity to do more netting for animals in a less formal way and they can also get more involved in the things that interest them. Adults are not discouraged from getting involved, and they often find that they have more to learn than their children about the wildlife on their doorstep. Other activities take place too, making this an ideal way to spend an hour or two. To discover when your local Discovery Day will be held this year, visit the Hi-Tech Wild-Trek events diary.or Test Valley’s web site.